Make simple syrup by dissolving sugar in water in saucepan over medium heat. In large bowl, cream together first four ingredients. Sift flour, soda, salt together. Mix well into butter mixture, stir in grated zest. Dough will be stiff; incorporate all ingredients well. Divide dough into manageable batches. Roll out on well-floured surface, to about 1/8" thick. Cut in shapes using cookie or round cutters. Place cut cookies carefully on prepared baking sheets, about 1" apart. Let cookies cool on wire racks before storing in airtight container. reserve solids for eating or for tomorrow morning’s breakfast smoothie! 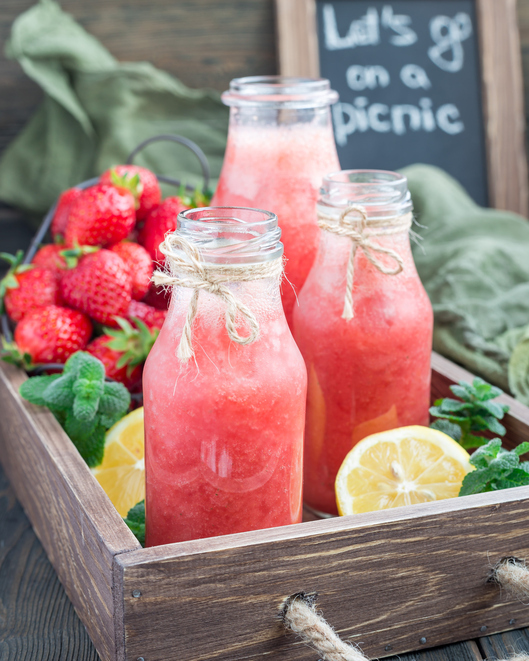 Combine strawberry juice, orange juice, lemon juice, water, and simple syrup in large container; stir well. Taste and add additional sugar if desired. Chill until serving, or serve immediately over ice. This summer, it feels as though everyone I know (except me) is escaping to fabulous vacation destinations. I am especially “joyfully envious” when I hear of someone visiting Italy. Naturally I ask them to please give my love to Lisa’s and my motherland. As our LA temperatures rise and I trust people desire a delicious way to cool off, I’m reminded of one of my favorite memories of being in Rome one very warm spring. Staying at the beautiful home of friends, I intended to be their Chef for the duration which didn’t really happen, but my first afternoon in their kitchen yielded an unforgettable experience. When I opened their refrigerator, not only did I find a “leg” of prosciutto and an entire wheel of Parmigiano-Reggiano cheese (which combined cost in America I promised them, would be about $10,000), there was a bowl of fresh sliced strawberries macerating in sugar. The lemon and orange trees in the backyard were filled with ripe citrus which lent heavenly aromas in the warm breeze. It was about 95 degrees in the shade of those trees. At the table together, our lunch meal (complete with the Parma prosciutto and cheese) was incredibly delicious. 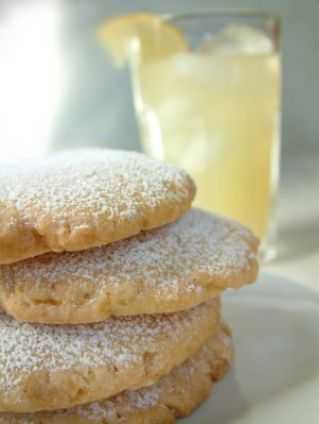 It was however, upstaged, by how amazingly special those lemon cookies were ... dipped in the fresh, blushing lemonade. When in Rome, or anywhere you are, I promise that pure summer joy is inevitable when you experience these recipes! Dip sugar cookies in lemonade for a refreshing summer treat!